Just when you thought Big 12 expansion was about to become a reality, one of its biggest proponents pumped the brakes Wednesday on the train that BYU hopes to jump aboard. 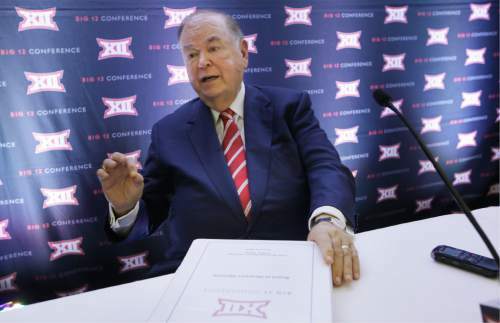 University of Oklahoma president David Boren said the idea of adding two or more schools to the Power 5 conference is "not a given" and "not a sure thing" at an Oklahoma Board of Regents meeting. "I&apos;m not saying there won&apos;t be expansion," Boren said. "But I am not saying it can be automatically assumed there will be expansion." Boren is the president who said last spring the Big 12 is "psychologically disadvantaged" when compared to other power conferences. Houston, Cincinnati, BYU UConn, Central Florida and South Florida are the top candidates, but several reporters who cover the conference on a daily basis seem to believe the no-expansion movement is gaining steam. Boren told the Oklahoman newspaper that the Big 12&apos;s 10 presidents and chancellors will listen to fan input before they make their decision. "How do they feel about it? Are they excited about the expansion pool? Do they feel these are people that will make them even more want to come to the games or not? We want that," Boren said. "We want them to get off the couch and want to come and if we do have expansion, we want to do it in a way that makes them want to get off the couch and want to come to the game." BYU reportedly made its pitch to the league last week. "I would just say that we&apos;re not ready for any dramatic announcements at this point," Boren said. The Big 12&apos;s Board of Trustees will meet Oct. 17 in the Dallas-area; Expansion is just one of many topics on the agenda.